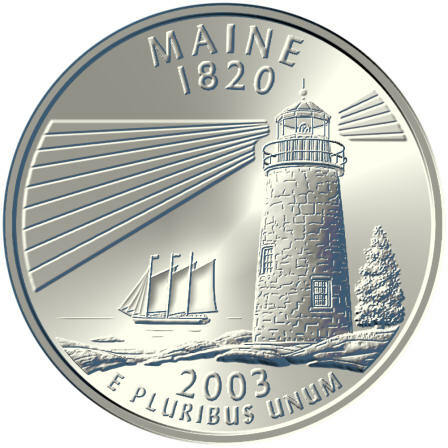 This was the original design that was chosen by the state of Maine for their quarter, as shown in a Coin World article. The US Mint, however, modified the design and folks in Maine apparently weren't too happy about that, as shown by a Coin World editorial. A light tower (inspired by the Pemaquid Point Light *) provides navigational bearing. A 3-mast schooner (inspired by the "Victory Chimes" **) passes by the rocky shoreline. These elements represent Maine's rich maritime history and they illustrate a few of the reasons why Maine is such a popular tourism destination. A young Maine White Pine (the state tree) represents the important forestry industry. White pines are conical in shape when young, with broad spreading branches near the top when mature. They are known for their tall, straight trunks. Because of this, they were sought after by early ship builders for use as masts - such as the three proudly displayed by the schooner. Of Maine's many lighthouses, the Pemaquid Light is one of the most photographed locations. First built in 1827 (and rebuilt in 1835), the Pemaquid Light was the first one in Maine to become automated (in 1935). It still functions as a navigational aid to this day. The home port of the "Victory Chimes" schooner is Rockland, ME. Built in 1900, it has been sailing Maine waters since 1954. In 1997 it was officially designated as a National Historic Landmark. It was also recently designated one of the world's top 200 yachts by a major boating magazine.